You are cordially invited to join us for the first night of Passover! Come celebrate with us and enjoy a family-style Seder led by Cantor Dorothy Goldberg at Temple Beth Shalom. Doors will open at 6:15, the Seder will begin at 6:30 P.M.
Due to limited space, we are prioritizing members, associate visitors, their spouses and children only. Non-Members who wish to attend must be Jewish. Spaces are limited so please make your reservation promptly. For reservations or more information contact Temple Beth Shalom from 10:00AM to 3:00PM Monday through Friday at 787-721-6333. We accept checks, cash, and VISA, Master Card and Discover. ¡Estás cordialmente invitado/a a celebrar con nosotros la primera noche de Pesaj! 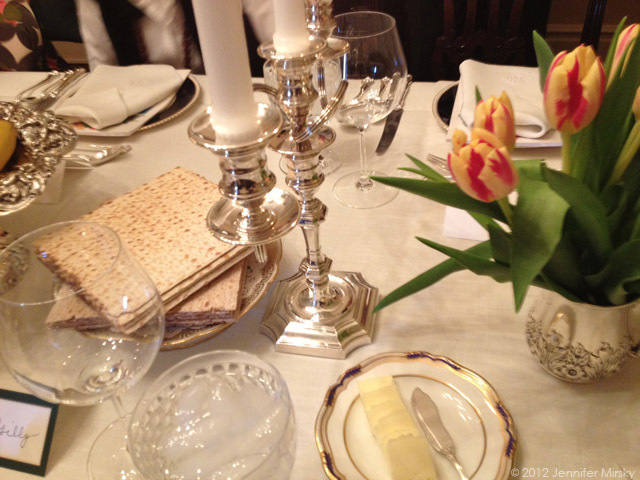 Disfruta de un Seder familiar dirigido por Jazanit Dorothy Goldberg en el Templo Beth Shalom. Las puertas se abrirán a las 6:15, el servicio comenzará puntualmente a las 6:30 P.M.
Debido al cupo limitado, estaremos priorizando a nuestros miembros, visitantes asociados, sus parejas e hijos solamente. No-miembros que quieran asistir tienen que ser judíos. Tenemos cupo limitado así que por favor reserve pronto. Para reservar u obtener más información llame al Templo de lunes a viernes de 10:00 AM a 3:00 PM al 787-721-6333. Aceptamos efectivo, cheque, VISA, Master Card, o Discover. This historic event is taking place Wednesday, February 20, 2019 at the Sala Sinfónica Pablo Casals (Centro de Bellas Artes de San Juan). 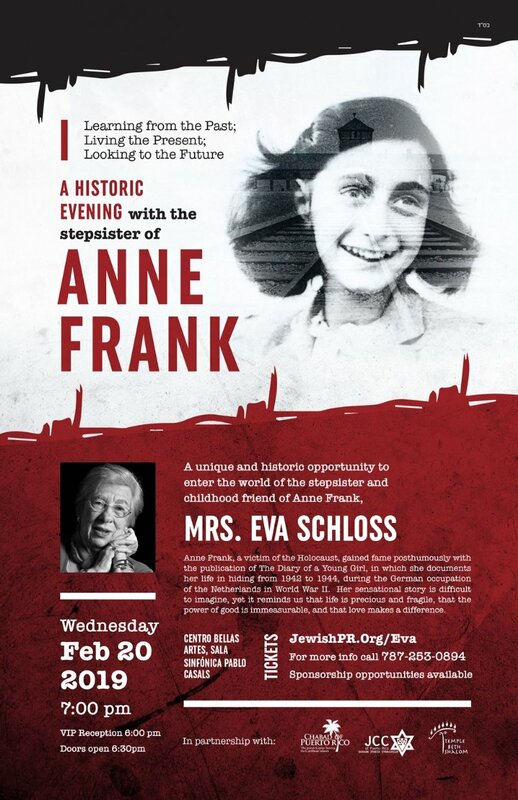 It’s a once-in-a-lifetime opportunity to hear Eva’s holocaust story. This is event is a collaborative effort undertaken by: Chabad of Puerto Rico, The JCC of Puerto Rico, Temple Beth Shalom of Puerto Rico, and the Jewish Federations of North America. Tickets may also be purchased by telephone (787) 620-4444, in-person at the CBA box office or at any Ticket Center kiosk. 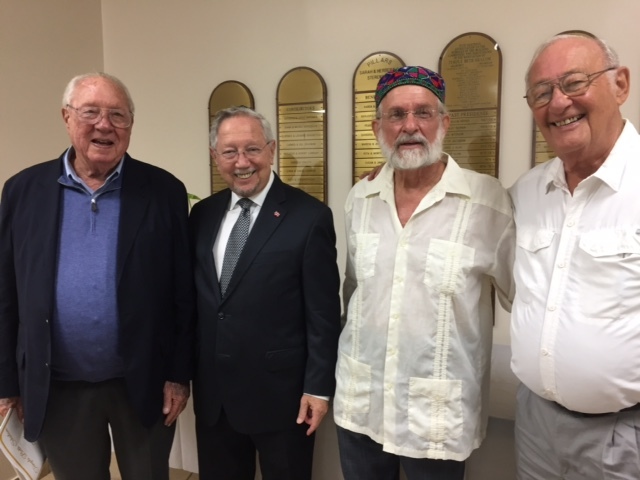 Peter Jacobson, TBS president, 1971-1973, spoke at the erev shabbat service, September 14th, shown here with Rabbi Patz and past presidents Dr Marc Schnitzer and Ron Rosenberg. On Thursday, September 20th, Rabbi Patz was one of the clergy invited to speak at the Ecumenical ceremony convened by the Puerto Rican Secretary of State to memorialize the one year anniversary of Hurricane Maria. The event included addresses by Governor Ricardo Rossello and Jeniffer Gonzáles -Colón, PR’s Resident Commissioner in Washington, D.C. The Secretary of Housing and Urban Development, Dr. Ben Carson, and Governor Rick Scott of Florida were among the honored guests at the emotional ceremony which took place at Castillo San Cristobal. Rabbi Patz was the first of the members of the clergy to speak. You can see the entire video below. Rabbi Patz’s message starts at the 22:45 minute mark. You can read his remarks following the video. [EN VIVO] Acto ecuménico en conmemoración del paso de huracán María por Puerto RicoAl cumplirse un año del paso del huracán María, el gobierno de Puerto Rico conmemora a las víctimas con un acto ecuménico desde el Fuerte San Cristóbal en el Viejo San Juan. and day for us all. And then the worst part, the painful aftermath and the slow start of relief efforts. Hurricane Maria dealt a heavy blow to an island already crippled by an overloaded and fragile infrastructure and the damages of Hurricane Irma. Yet, despite the challenge, unprecedented in scope, spontaneous relief efforts began instantly. Residents started gathering debris, removing trees that blocked roads, all by themselves. Restaurants opened, with severely limited menus – cash only, of course. One restaurant offered a huge cookie with a swirling hurricane design on it. In defiance of the destruction and the astounding flooding, Puerto Rican flags began to appear everywhere, many with the words Puerto Rico se levanta! attached to them. The spirit that prevailed everywhere was straight-out resilience. Puerto Rico se levanta a pesar de todos los obstáculos. isolated mountain locations, along with instructions in how to use them. Even last month, our members were in Utuado, one of the hardest hit communities, working on water purification. distributed prepared meals and 185,000 pounds of food to 25 municipalities, with five full-time workers – nearly $2 million of needed supplies. recover our gratitude to God by acting with kindness and generosity to all in our beloved Puerto Rico. Somos más débiles, y tambíen somos más fuertes! We have learned how to survive and we will make it, with God’s help – con la ayuda de Dios. Due to the damage caused by hurricane Maria, our telephone line is still not in service. You may contact us via email, but please understand that we have gotten so many messages of support in the last few months (thank you!) that it has been difficult to catch up, and it may take some time to respond. The pace of recovery has been frustratingly slow. The roads are extremely deteriorated and only some traffic lights have power, so driving around is still quite hazardous. In many places outside the San Juan metro area the situation is still dire, with entire communities continuing without electricity or access to drinking water, and many roads destroyed by landslides. The collapsed infrastructure seriously impacted the already recession-weakened economy. Many people have still not been able to return to work, and many small and mid-sized businesses have been forced to shut their doors indefinitely. Over 100,000 people have fled the island. It has been difficult to keep our website updated, but things are improving somewhat. Leaves have grown back on the trees that remained standing, which had been stripped bare. The power is back in many areas. We have had power and water back at the Temple since mid-November, and we are holding regular services. Our Rabbi returned in mid-December, which means that our congregation has had more direct support for the spiritual aspect of this crisis as well. Because the immediate emergency has passed, and because we have been fortunate in getting donations of generators and water filters and even money for the most distressed cases from the JFNA, the URJ, and individual families and congregations, the immediate emergency needs of water, food, medicine, etc. of the members of our congregation have abated. We continue to receive support from people such as yourself, and we continue to extend that support to other communities that are still in need whenever we receive goods we know are still needed. Thanks to some very generous donors, we were able to distribute over 250 water purifiers to families in San Juan, Canóvanas, Las Marías, Añasco, Cayey, Utuado, and Comerío. However, Temple Beth Shalom will be feeling the effects financially for quite some time. Our building has been damaged but can be repaired with the funds donated from individual families and congregations. What cannot be repaired so easily is the financial hit that many congregants were met with which makes it impossible for them to pay their dues to the Temple, as they need their money to feed their families.Because we were without power for so long, we now believe it is essential to switch to solar power permanently, so as to never again be subject to the vagaries of the fractured power grid. We need to reduce our energy needs to make it more cost effective to produce our own energy with solar power. We are evaluating our current energy consumption and identifying ways to reduce it, including redesigning our air conditioning system. Our kitchen appliances, especially our freezer and refrigerator, were all donated long ago and need to be replaced with energy efficient appliances. We need a resilient solar power system that can power the entire building that is hurricance-proff, or can at least be easily taken apart and brought inside to protect it from future hurricanes.You can help us meet this goal by making a donation here.